Are clams healthy? Yes, because they are rich in vitamins B12 and C, minerals like iron, selenium and manganese besides protein, and omega 3 fatty acids. Clam is a general name given to many bivalve sea creatures. There are about a dozen of these variously sized, chewy sea delicacies that are salty to the taste. Clams belong to the mollusk family along with oysters, mussels, and scallops and most people tend to confuse them. Clams occur in hard-shells and soft-shells. Clams are mostly found in freshwater and are common along the shores of the Pacific and Atlantic Oceans. They are a popular seafood; but are clams healthy? Are Clams Good For You? Clams are dense with vitamins and minerals. They contain selenium, manganese, copper, phosphorus, vitamins B12 and C. If you are looking for a natural alternative to fulfill your vitamin and mineral requirements, clams can be that source. It may come as a surprise, but yes, clams will provide you with more iron than beef. This means that you can safely consume clams as your primary source of iron. The recommended daily intake of iron for an adult is 8 milligrams and a 3-ounce serving of clams will provide your body with 24 milligrams! These easy to cook sea creatures will help boost your hemoglobin levels, thereby boosting your health tremendously. What is more, the vitamin C in clams also helps your body to absorb more iron. If you are looking for a healthy way of taking omega 3 fatty acids supplements, you should consider eating clams. The daily recommended amount of omega 3 fatty acids is 250 milligrams and one serving of clams will deliver 140 milligrams to boost your cardiac health and keep you in tip-top shape. Vitamin C is a naturally occurring vitamin that can greatly boost your immunity. And because clams are packed with this vital vitamin, they have many health benefits for you. Deficiency of vitamin C exposes you to many ailments and infections. A single serving of clams will provide you with about 18 percent of the recommended daily dose of vitamin C.
Are clams good for you? In more ways than you can imagine! 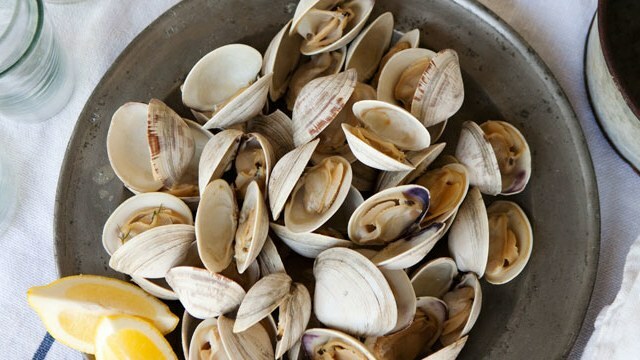 Clams are a better source of lean protein compared to fish and chicken. In fact, clams beat chicken meat by 20% in protein, and less fat for that matter. Consuming clams as your primary source of protein will ensure that the cholesterol level in your body is kept in check. Eating clams helps reduce cholesterol level in your liver and blood because they are low in saturated fats. This means that you become less vulnerable to conditions associated with high cholesterol including heart disease. Vitamin B12 deficiency is often characterized by constant fatigue and weight loss. A lack of this vital vitamin will cause megaloblastic anemia which presents with feelings of tiredness and general body weakness. Clams contain high levels of vitamin B12 and will help prevent or address this deficiency so that you have adequate energy to carry out your day to day activities. Are clams good for you? Of course; but you need to take care how you eat and consume them. Unless you are entirely sure that the clams are fresh, it is not advisable for you to eat them raw. Otherwise, wash your clams thoroughly, preferably under running water before steaming them. Consume your shellfish as soon as you get it from the market since clams are highly perishable. Don’t worry about availability because clams are available all year round stored in cans and frozen. You can tell the freshness of shellfish by how it weighs and from how they smell. Ensure that the clam is dense in weight, feels plump and does not emit the smell of ammonia. Store an unshackled clam in a refrigerator inside a porous natural material like burlap. Do not store clam for more than four days in your freezer; otherwise, it will have a rubbery texture. Eat fresh clam within 24 hours. Caution: Soft-shelled clams are usually eaten raw, but the trend is not advised because raw clam may contain a bacterium called vibrio vulnificus that may cause serious health issues in people with underlying health problems. You can steam, bake, fry or boil clams. Soft-shelled clams can also be eaten raw. Clam dip is a favorite party dip. Search the web for recipes for hot and cold clam dip. Clam chowder is a delicacy in many parts of the world. Try out a bisque and Manhattan-style clam and enjoy every serving of good health. Clams are also a perfect side dish for pasta. Try out the red sauce, pan-seared with a dash of olive oil or white-sauce. A meal of stuffed peppers, vegetables, and clams. • Thoroughly clean the clams under cold running water. • Soak them in a bowl of salted water until ready to cook. • In a pan, over medium heat, fry the garlic in olive oil, and sprinkle sea salt and red pepper flakes as required. • Remove from heat and pick out the unopened clams. Add butter to the pan and give a good shake. • Sprinkle fresh chopped parsley and serve with your favorite pasta.